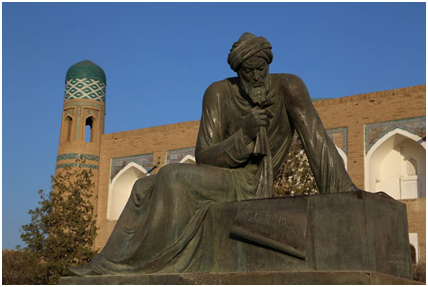 Muḥammad ibn Mūsā al-Khwārizmī (ca 780-850; picture) was a Persian mathematician, astronomer, and geographer who lived during the Caliphate of the Abbasids, a dynasty that ruled in Baghdad from 750 to 1258, one of whom, Caliph Hārūn al-Rashīd (ca 763-809), features prominently in the Tales of 1001 Nights. Al-Khwārizmī’s work has given us two mathematical words. His treatise al-kitāb al-muḵtaṣar fī ḥisāb al-jabr wal-muqābala, which can be translated as Concise Treatise on Calculation by Restoration and Compensation, published in about 830, introduced the Western world to Indian mathematics. The word “al-jabr” in the title comes from the Semitic root GBR, meaning to be or become strong, to prevail, or to work. The name of the Archangel Gabriel literally means strength of God; “el” in the name is the Hebrew word ﬡﬥ, meaning God, as seen in the names of many angels, such as Michael (who is like God? ), Raphael (God has healed), Uriel (the light of God), and Zadkiel (the righteousness of God). GBR also carries a connotation of restoration, since what is restored regains its strength, and al-jabr was used to mean bone setting or the surgical treatment of fractures, a meaning that carried over into derivatives in some European languages, particularly Italian, Spanish, and Portuguese. 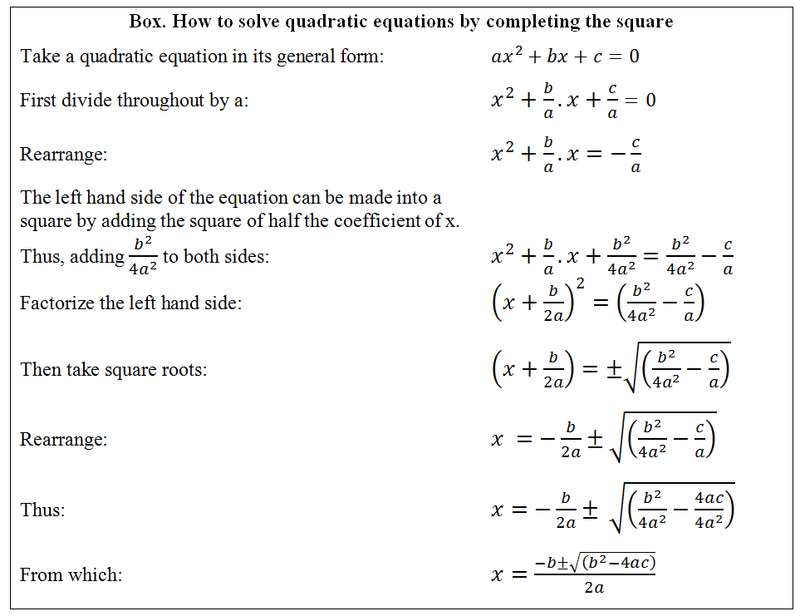 However, in al-Khwārizmī’s text, “al-jabr” implied a method of solving quadratic equations by completing (i.e. “restoring”) the square, as shown in the box below. From “al-jabr” we get algebra, which originally denoted all forms of mathematics. The last word in the title of al-Khwārizmī’s text, [w]al-muqābala (the w stands for wa, meaning “and”, which is elided with al, meaning “the”), gave the now obsolete word “almacabala”, which was what we nowadays mean by “algebra”, but with mystical connotations. Another treatise of al-Khwārizmī’s, now lost, on the decimal system of numbering, which depended on the invention of the symbol for zero, was translated into Latin in the 12th century as Liber Algorismi de numero Indorum, which introduced Arabic numerals to Western scholars. And so, transliteration of the name “al-Khwārizmī” gave rise to the word “algorism”, which originally meant the decimal system of numbering or calculation carried out using Arabic numerals, rather than the cumbersome Roman ones. Then, in the 17th century, because of confusion with “arithmetic”, which algorism was, “algorism” became “algorithm”. “Algorithm” originally referred to the Arabic decimal system of numbering, but by the beginning of the 19th century it had come to mean “a precisely defined set of mathematical or logical operations for the performance of a particular task” (OED). And in the middle of the 20th century it gained a medical meaning, “a step-by-step protocol used to reach a diagnosis, prognosis, or decision”. The earliest English language paper that I have discovered in PubMed in which the term “algorithm” is used in a medical context was published in 1969 and deals with the use of the Minnesota Multiphasic Personality Inventory (MMPI). 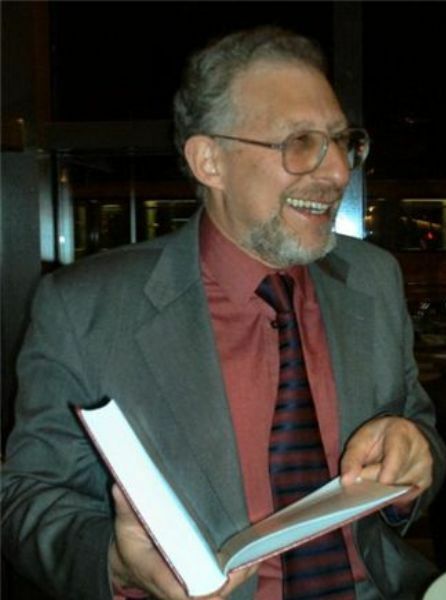 The authors referred to the work of Paul Meehl, a clinical psychologist, who in 1954 published a book called Clinical Versus Statistical Prediction: A Theoretical Analysis and a Review of the Evidence, in which he demonstrated the general superiority of what he called actuarial (i.e. algorithmic) predictions over clinical predictions, although he didn’t use the word “algorithm”. Meehl emphasised this result again in a paper published in the Journal of Personality Assessment in 1986, titled “Causes and effects of my disturbing little book”, in which he wrote that “Review and reflection indicate that no more than 5% of what was written in the 1954 book . . . needs to be retracted 30 years later. If anything, these retractions would result in the book’s being more actuarial than it was.” Since then a meta-analysis by Grove et al has shown that, on average, what they called “mechanical prediction techniques” were about 10% more accurate than clinical predictions and were at least as good or substantially outperformed clinical prediction in most studies. In only a few studies were clinical predictions substantially more accurate than mechanical predictions. More about algorithmic versus clinical methods next week.